Follow this track uphill and you emerge onto open ground with the slopes of Ballycumber to your right. Keep an eye out for a ring of trees just above you to the right-this marks the remains of a ring fort. Soon after the ringfort at about T050 760 D turn right uphill and head SW. Follow various animal paths through the heather until you reach the saddle just west of the 397m spot height. Up to now it has been open bog and hillside. Now aim for a point at T039 758 E where a fence can be seen holding back the forestry. This forestry is not marked on map 62 and it actually extends to the summit. By staying on the open hillside and by following this fence as it heads uphill to the west you will reach the summit trig pillar of Ballycumber Hill. Views to the north are limited by forestry. 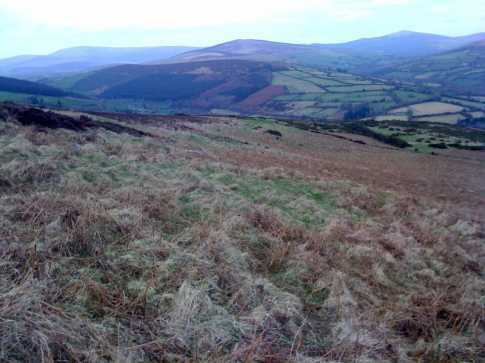 However some of the more obscure hills that I had the pleasure of making the acquaintance of over the last several months were visible to the south-Muskeagh, Seskin, Lackeen and Stookeen. Also I was delighted to see my old pal Preban Hill to the north as I climbed Ballycumber. Never heard of these hills?-they are well worth checking out!